SDI’s Voice Picking solution is designed to deliver a high performance, hands-free paperless order picking solution for applications with a large number of SKUs spread throughout the distribution center, that require few reaches per unit of travel (low pick density). 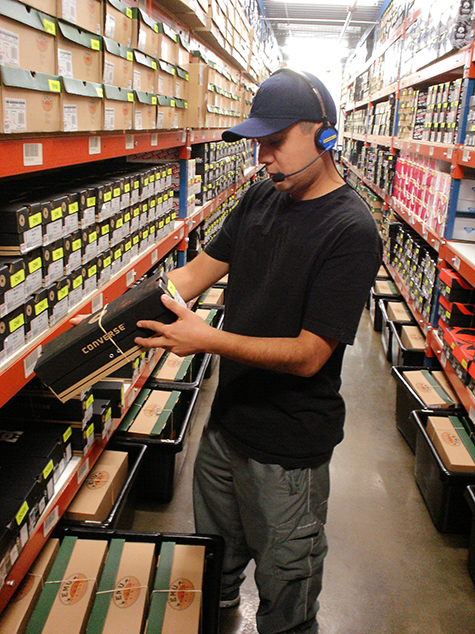 Voice Picking virtually eliminates picking errors, maximizes picking productivity, reduces labor costs and extends inventory control substantially. With Voice Picking, each order picker is equipped with a Voice Terminal, Headset and an optional Ring Scanner. Using natural voice prompts, the Voice Terminal directs the order picker’s attention to each location that requires a pick. The picker speaks a “check digit” associated with the physical pick location or scans the location barcode and the system verifies that the picker is at the correct location. Voice Picking then instructs the picker to pick the required quantity. As each item is picked, it can be confirmed as picked complete or picked incomplete by responding with the appropriate command to the system. The order is automatically updated with what has been picked fully and what must be backordered or picked later when the location is replenished. Once an operator is trained to use Voice Picking, usually in less than an hour, individual picking productivity and accuracy is improved substantially; improvements of over 30% from RF Picking and greater than two times from paper is typical.